Best practice analyst relations is changing. It is quickly being surpassed by strategic, relationship-based plans that show immediate results. In a Kea Company analyst relations webinar, Teri Green, Duncan Chapple and Stephen Miller will not only discuss shifts in the commonly-held ideas about ‘best practice’ but also outline a new frontier of excellence being established by fast-growing AR teams. The Analyst/Advisor Attitude Survey has shown this new frontier is being explored by several major firms, including Amazon Web Services, HERE, Huawei and NetApp. While they have very different strategies and tactics, these analyst relations leaders have overtaken traditional ‘powerhouse‘ leaders in many ways. While the Survey shows what has happened, our IDEAL audit shows how this has happened: Over the last ten years, the Audit has tracked the efforts of many of the largest analyst relations teams and shows the bottlenecks in their analyst relations process. 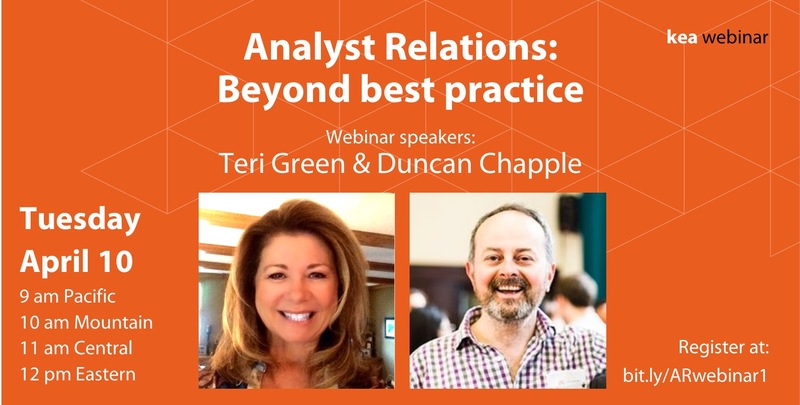 Teri Green and Duncan Chapple make great leaders for this analyst relations webinar. Green has recently retired after a series of relationship management roles at PwC, Sapient, Microsoft and Apple. She has a unique understanding of the value of strategic, proactive AR and how analyst relations helps firms to develop both channel partners and direct sales. Chapple is a former Ovum analyst who has led analyst relations programs both in-house and at agencies with specialized AR teams. He has helped most of the world’s largest tech vendors and ICT solutions providers. Stephen Miller, who manages Kea Company’s research projects in North America, will introduce and moderate. This entry was posted in 3. Engage & Influence, Webinars and Videos. Bookmark the permalink.